Tired of the same old ground beef recipes? Fry up this one-dish meal in a nonstick skillet and cleanup is a snap. It’s a sort of succotash, but adding meat makes it a complete meal while also adding a wonderful, sausage flavor. Choose a flavorful, lean, very high quality sausage in hot, medium or mild depending on family tastes. No other seasoning is needed. This is as easy to make as the hamburger-tomato mixtures we campers cook so often (too often? ), but it’s totally different. See how your family welcomes the change. 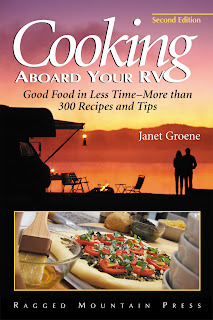 Janet's RV cookbook is published in both English and French.